A good batter dispenser is a great deal to save time in the kitchen while making sure all your pancakes, cupcakes, muffins or anything you make look just perfect. Our premium range of batter dispensers and funnels are intended to dispense just the right amount of batter to keep all your delicious pancakes, cupcakes, crepes, waffles, and more. uniformly sized without costing an arm and a leg. We offer clear polycarbonate as well as stainless steel batter dispensers from the well-known brands that mark them as a product of quality and durability. The clear polycarbonate batter dispenser gives you perfect visibility when filling or dispensing while the stainless steel ones are highly durable, which make them fit for commercial bakery use. 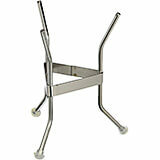 A stand to hold funnels or cone strainers is also available. 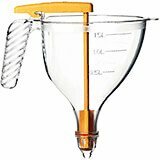 Clear, Polycarbonate Batter Dispenser, Automatic Funnel, 0.75 Qt. 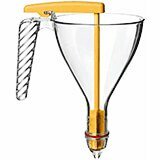 Clear, Polycarbonate Batter Dispenser, Automatic Funnel, 1.5 Qt. 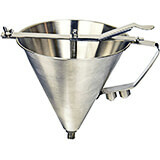 Stainless Steel Automatic Batter Dispenser / Confectionery Funnel, 2 Qt. 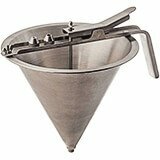 This Paderno world cuisine 7-1/2" diameter stainless steel automatic confectionary funnel is used to dispense a smooth flow of fondant, syrup and prepared creams. It comes with two nozzles. It is operated with a spring valve and is easily controlled with one hand. It has a 2 Qt capacity. 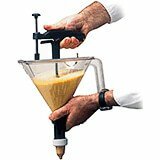 Stainless Steel Batter Dispenser / Funnel, 2 Qt. Confectionery Funnel made of stainless steel, opening nozzle measurement is 1/3" Delivered with two additional nozzles of 1/8" and 1/4". Capacity 2 quarts. Measurements: 7 1/4" Diam. x 7 1/8" H. Weight: 2 lbs. 2 oz. 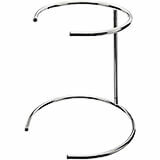 Stainless Steel Stand for Funnel / Cone Strainer, 7.5"
Funnel stand made to fit item A4780019 (Automatic Batter Dispenser) or to hold other funnels / cone strainers of the same size. Stand For Confectionery Funnel (258825) And Bouillon Strainer (017360). Measurements: 5 1/2" Diam. x 8 7/16" H. Weight: 1 lb.